added to the LoL client from Riot Games: The customized item sets. Have you ever wanted to create a personal item set for the in-game shop depending on the champion and playstyle? Well now you can do it! With this new feature you will be allowed to create your own shop lists so that you can have an easy access to your favourite champion builds. Riot has added a new tab to your profile called "Item sets". Click on it and you will be re-directed on the editor tool. 1) On the left a list of your saved sets (5) where you can create (1), save (2), delete (4) or undo (3) all the changes, on the selected set, done after the last save. 3) On the right you can find your tool to customize the shop tabs. note that if you drag an item in an empty tab or click on it (1-C), a new sub tab will be added, ready to be customized. Whenever you would like to delete a sub tab, just click on the "X" localized in the right of the sub tab name (1-B). Once you are done with the editing, you can proceed with the selection of the maps and champions for which the item set would appear in the shop tab selection. Once you are in the "Maps and Champions" tab (B), you will find 2 options in which you can decide to restrict an item set to certain maps and champions (5-A,6-A). Whenever you decide to use this function, a list of the maps and champions will show up (5,6) so that you can select the ones in which you want the item set available. 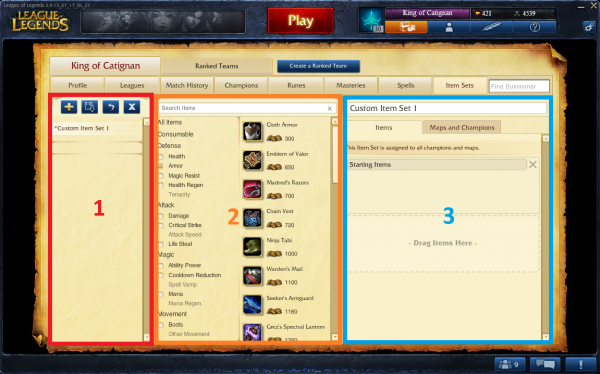 To make the work fast, a search and filter system can be used for the champion selection (6-B). 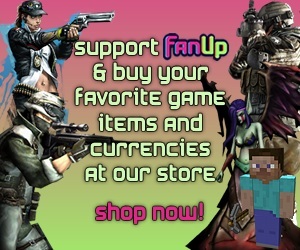 Fan if you like and comment whenever you have an opinion!